This open source TALE toolbox kit provides a complete set of plasmids for building your own TALE nucleases (TALENs) and transcription factors (TALE-TFs) for genome editing and transcription modulation applications. A transcription activator-like effector toolbox for genome engineering. Sanjana NE, Cong L, Zhou Y, Cunniff MM, Feng G and Zhang F. Nature Protocols 7, 171-192 (2012). PubMed PMID 22222791. Efficient construction of sequence-specific TAL effectors for modulating mammalian transcription. Zhang F, Cong L, Lodato S, Kosuri S, Church GM and Arlotta P. Nature Biotechnology 29, 149-153 (2011). PubMed PMID 21248753. Transcription activator-like effectors (TALEs) are a class of naturally occurring DNA binding proteins that can be easily customized to recognize novel DNA sequences.The DNA binding domain of each TALE consists of tandem 34-amino acid repeat modules that can be rearranged according to a simple cipher to target new DNA sequences. Customized TALENs and TALE-TFs can be constructed within one week using this kit, and the process can be easily scaled up for the construction of multiple TALEs in parallel. This toolbox and accompanying documentation allow one to efficiently assemble TALEN constructs with custom repeat arrays, containing up to 24 of these repeats. The reagents include a plasmid construct for making custom TAL effectors and one for TAL effector fusions to additional proteins of interest. More information and help can be found at TALeffector Resources Center (www.taleffectors.com). Please note that the plasmids from this paper and the TALE Toolbox are not equivalent. The new monomer NI, NG, NN, and HD that come with this kit are updated. This new set is compatible with the new primer design, which allow TALEs to be assembled in a more efficient manner (it also allows for the construction of longer TALEs). The new constructs also have bioinformatic support from the taleffectors.com website, so that users can assemble TALE sequence with the Zhang lab’s online resource. 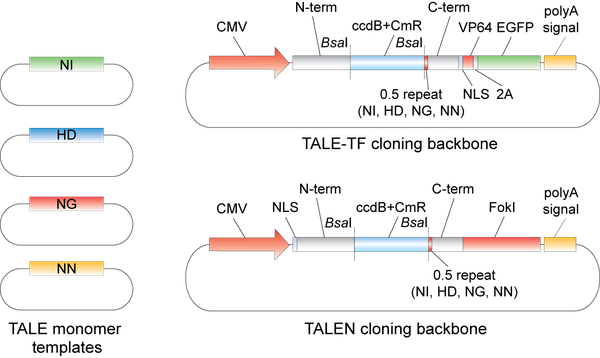 The most important similarity between the Nature Biotechnology constructs and the TALE Toolbox plasmids is that both versions were optimized for human expression. In this regard, they are similar in terms of expression efficiency, which is evident in the less than 0.01 difference between the two sets of TALE monomers when computing their codon preference for Homo sapiens. A 1-page rapid assembly protocol has been created by the depositor to be used with this kit. A detailed description of this toolbox as well as protocols for testing the activity of custom TALENs and TALE-TFs in mammalian cell lines is described in the associated publications. "The plasmid kit used for building TALENs and TALE-TFs was a gift from Feng Zhang (Addgene kit # 1000000019)"